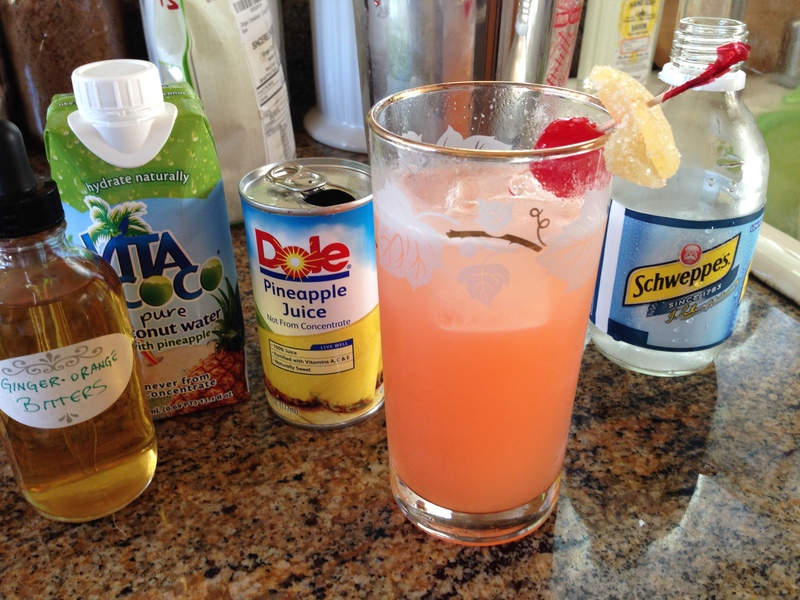 The Pineapple Fizz and its ingredients. When you get to my age, an increasing number of your friends will announce that they are having a baby. This is a joy cuz, come on, it’s a new soul entering the Earth for you to corrupt… erm, I mean, pamper. Yeah, that’s what I meant. Now, it’s also a bit of a bummer because we’re losing a drinking buddy for like a year!! Of course, the bonus is that we now have a built-in Designated Driver! YAY! Oh, uhm, I mean… yeah, forget it. I mean: YAY! Still, in an effort to keep our designated driver happy, I will be concocting different mocktails over the course of the next 9 months. I’ll pepper them throughout the blog as we go along. First out of the gate is this tropical number that feeds into two soon-to-be-announced Booze Guru Original cocktails. This leverages ingredients that create the PERFECT beverage for the Mom-to-Be. It’s light, fruity, and moderately sweet. Now, I made my own Orange & Ginger bitters. It’s not hard making the stuff, but it can be rough finding bittering agents. If you want to talk about homemade bitters, hit me up here or on email. Add ice to a Boston Shaker. Add all the ingredients except the Club Soda. Shake until your hands feel like they’re going to freeze off. Fill a Highball glass 1/3 with ice cubes. Strain the drink into the Highball glass. Top with Club Soda. Garnish with crystallized (candied) ginger and a maraschino cherry on a skewer. It’s the FIRST Booze Guru original mocktail! Susy May, this one is for you! Looks pretty good for a mocktail! Thanks! I’d prefer adding some gin, but no gin for pregnant friends!